Sarah propositioned Eric, Hope and Rafe shared an anniversary, Haley agreed to get married, and John trapped Diana this week in Salem. 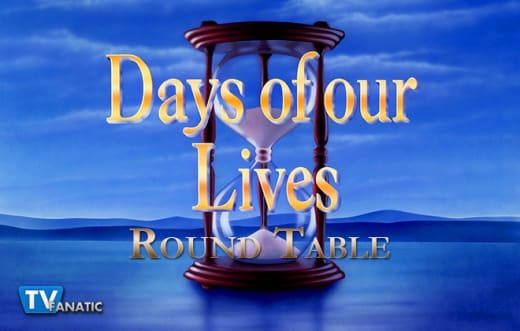 Our TV Fanatics, Jack Ori and Christine Orlando are joined by Tghca and Sportsgirl from MyHourglass a Days of Our Lives fan forum to debate Sarah’s feelings for Rex, the chemistry between Ben and Ciara, all things Leo, and Haley’s marriage plans. Is Sarah sincere in giving Rex a second chance or is she using Rex as her consolation prize because she can’t have Eric? Sportsgirl: She enjoys being with Rex but she isn't in love with him. Unfortunately, he has become her consolation prize. Tghca: I think Sarah in her own way does love Rex but just not in the way she loves his brother Eric. I think Sarah and Eric have always had a connection from the moment they met and then they became friends rather quickly. Eric was there for Sarah after what Rex put her through just like how Sarah was there for Eric during the whole mess with Nicole. Nothing like having those kinds of problems brings two people closer together. All in all, yes Sarah is using Rex as her consolation prize because she can't have Eric. Jack: I think she's convinced herself she's sincere, but she isn't. She wants Eric and is settling for Rex. She needs to dump Rex and spend some time thinking about what she really wants since it's not him and Eric won't go there. Bonus points if she goes out of town for a little while to think things over. Christine: I don't think Sarah is in love with either of them. She's comfortable with Rex and they have fun but she doesn't trust him and she's attracted to Eric. Since Eric turned her down, she is using Rex as her consolation prize. Sarah needs some serious alone time to figure out what she really wants but we all know the odds of that happening are pretty slim. Do you find Leo despicable or sympathetic? Sportsgirl: He used to be a joke but now I am in the middle with him. He apparently had a terrible childhood, but that does not excuse all his terrible behavior. I cannot say he's totally sympathetic because he still wanted to use Brady instead of being happy of having a brother and getting to know him. Tghca: Leo to me is still despicable as he has no redeeming qualities at all in my opinion. I mean look at who he has for a mother. It is no wonder why Leo is the way he is and John thinks this man is his son but I still think that he's not. Either way, after the things he's done to Will and Sonny, he gets no sympathy from me whatsoever. Jack: Both. I don't like his con artist side, and there often seems to be no low he won't stoop to. Yet at the same time, I understand that he's acting out of pain because his stepfather or whoever Richard was (still not convinced John is really Leo's father) was abusive and Diana let it keep it happening. I thought Brady was way out of line suggesting Leo will never be anything but a prostitute. Christine: He's both, which is fascinating. I think Greg Rikaart has done a fantastic job at making Leo complex. Leo has done despicable things but I don't think he's ever been shown a better example. He really didn't seem to understand why Brady was angry with him and ruined his payday. And I agree that Brady telling Leo to go back to being a prostitute was shameful. Leo craves love and acceptance but has no idea how to get it because he's never had it. I'm hoping he is John's son because it could be intriguing to see how Leo responds to being John's son over time. Which makes more sense for Haley, marrying JJ or marrying Tripp? Sportsgirl: If this had been handled correctly prior to all this, this wouldn't even be needed. I see her point when it comes to JJ, the distrust, the going from getting to know each other to a possible real marriage "as JJ put it". This is all scary for Haley so doing this with Tripp takes away the commitment to feelings. Not sure though if it is the best idea. Tghca: Haley marrying Tripp makes more sense because out of the Johnson men, Tripp is more sympathetic to Haley's plight than JJ is. JJ gave up Haley by talking to his old man when he could have just kept his mouth shut. It was not his secret to tell Jack or anyone else. Unlike JJ, Tripp would never give Haley up like that. Tripp, deep down I think, also has feelings for Haley but just can't bring himself to admit it. Jack: Neither one of these options makes any sense at all. Haley's initial comment that the authorities will be suspicious of her getting married the second she is ordered out of the country was spot on. But if we're going to go this way, I guess marrying JJ makes more sense since she actually lived with him and had some sort of quasi-romantic relationship beforehand, plus he doesn't have another girlfriend that has to be explained away (not counting Paige's ghost who is never referenced). Christine: I hate both options. 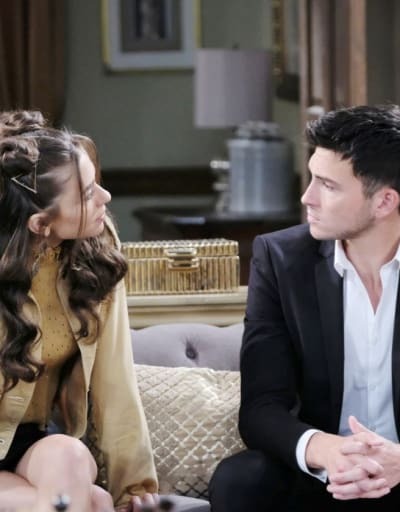 Haley has a history with JJ which adds credence to the marriage story, but he's pushing for a "real" relationship which could be intimidating if she's not feeling it. With Tripp, things are more clear cut. This is simply to keep her from being deported but asking Claire to stand by and watch this happen (even if he wasn't half-crazy) is ridiculous. In the end, neither scenario really makes sense. Ciara and Ben are back together. Rate their chemistry from 1 (cold) to 10 (steaming up the screen). Sportsgirl: Ben is a 9 but together they are maybe a 6 to me. I can't forget his past and I can't forget how immature she still is in many ways. He is a bit older than her. Jack: I know I’m in the minority here, but I don't see a lot of chemistry. I'll give them a 3. They're mildly interesting but are a way watered down version of Jack/Jen or JJ/Paige as far as I can see. Christine: A 10. I don't even want to like this couple. Ciara can be such a brat sometimes and how do you reform a serial killer? But I have to admit that when they're together, they steam up the screen. I think they have the best chemistry of anyone in Salem right now. What do you want to see happen to Diana now that she’s been caught? Sportsgirl: She needs to be sent to Bayview. According to Leo, her husband was an abuser and she snapped because of him. She needs mental help, not jail. Tghca: Diana going to prison or she ends up dead in a Who Done It murder mystery and you would have your fair share of suspects. Jack: I'd like her to go to jail or maybe Bayview. Seeing her interact with Jordan in the psych ward might be fun. Christine: Ugh! What happened to the sweet, fun, smart Diana Colville that I enjoyed years ago? I don't know what to do with this version. Diana tried to murder a woman in order to steal her man. Prison seems the only logical option but Diana has turned into a fun villain so I hope it doesn't happen too soon. Which storyline do you care the least about right now? Is there a story you didn't think you'd enjoy but you are? Sportsgirl: I can't stand the whole Hope/Rafe/Ted storyline. Ted is a total jerk. Leo is a more enjoyable character and the actor, Greg Rikaart, is nailing it. Tghca: Storyline that I could care the least about for me would have to be whether Leo is or is not John's son because the character of Matthew/Leo doesn't interest me. A storyline that I didn't think that I would enjoy but now that I am starting to enjoy would have to be Stefan, Chloe, Brady and Gabi because of the actors involved but mainly now more so because of the recast Stefan. I love Brandon Barash...Loved him on GH as Johnny Zacchara so to see him as the new Stefan I definitely know that he and Nadia Bjorlin (Chloe) will have chemistry. Jack: I care so little about Rex/Sarah/Eric that I hate even writing their names. LOL. I don't enjoy stories about overgrown teenagers and so far I have no reason to invest in either Sarah/Eric or Sarah/Rex. Rex is oblivious and stuck in puppy love mode, Sarah is moody and throws tantrums, and Eric is only likable when Sarah is not in the picture. And Marlena and Maggie encouraging Sarah and Eric to choose each other while Sarah is in an allegedly committed relationship with Eric's brother is ridiculous. I continue to be surprised at how interested I am in Leo lately. When he first came back to Salem I felt he was a one-note bad guy who we didn't need but he's the most complex villain we've had in ages and the first one to have a sympathetic side in forever. Christine: Jack's involvement in this immigration story. I was so excited to have Jack back in Salem but it's been a complete letdown. As for the story I didn't think I'd enjoy but am, it's Leo being John's son. I rolled my eyes when I first heard about it but the actors (Drake Hogestyn and Greg Rikaart) are doing such a great job with the few scenes they've had that I really want to see more. Sportsgirl: I enjoyed seeing Belle and Tony/Andre again in the Marlena purgatory scene. It was refreshing seeing different and familiar faces for a change. Tghca: My favorite scene most definitely had to be Jack and Jennifer in the square. Jack during his interview with Jennifer was being so smug and so arrogant towards Jennifer. However, Jennifer gave it as good as she got and threw water in Jack's face. Least of what Jack deserved and proof that Jennifer is probably better off without Jack in her life memory or no memory. Jack: Some of the stuff during the Marlena afterlife adventure made me laugh out loud, especially Tony saying that that urn looked familiar. Back to Earth, I liked Jen grilling Jack and their argument over who was spewing fake news. It had some of that same sizzle their sparring always had despite Jack's amnesia, anger and lack of interest in Jennifer. Christine: Gina telling Marlena that she'd been reduced to the dust on the bottom of Brady Black's shoe was pretty funny. I also loved the flash-forward where Claire steals Ciara and Tripp's baby to sell on the black market. I can completely see Claire doing something like that in the future! Now it's your turn TV Fanatics. Who do you think Haley should marry? Want to chat more about the happenings in Salem? Then check out Jack Ori's Days of Our Lives review here at TV Fanatic.